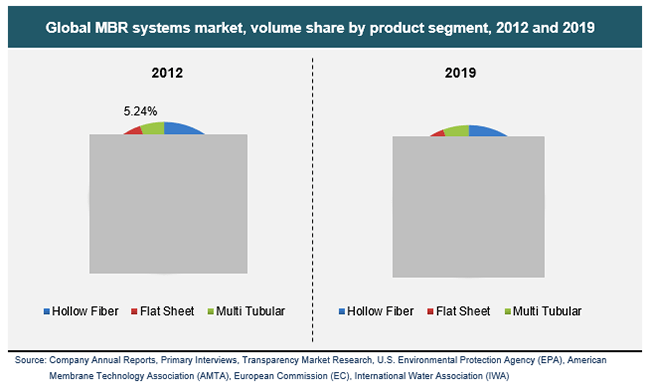 The global market for membrane bioreactors is the focus of a new market research report published by Transparency Market Research. The report states that the global membrane bioreactor market, with a valuation of US$963.8 mn in 2012, will expand at an excellent 14.50% CAGR between 2013 and 2019 and rise to a valuation of US$2.5 bn by 2019.The report is titled “Membrane Bioreactor (MBR) Systems Market - Global Industry Analysis, Size, Share, Growth, Trends And Forecast, 2012 - 2019” and is available at the company website for sale. The flourishing market for water purification techniques is one of the key driving factors of the global membrane bioreactor systems market. Membrane bioreactor systems have high demand in large-scale water purification projects. Government regulations regarding the purity and quality of water used for domestic purposes are becoming increasingly stringent, resultantly leading to the increased demand for MBR systems. The rising restrictions on affluent discharge from industrial and commercial sites are also driving the demand for MBR systems. Declining freshwater reserves across the globe are also driving the market. Over the years, MBR systems have replaced conventional activated sludge systems owing to their effectiveness in settling the activated sludge in secondary clarifiers. Thus, their significance has substantially increased in a variety of commercial and industrial applications. The report segments the global MBR systems market on the basis of four criteria: application, product type, configuration, and geography. On the basis of application area, the market is segmented into municipal wastewater treatment and industrial wastewater treatment. On the basis of product type, the market is segmented into hollow fiber, flat sheet, and multi-tubular systems. On the basis of configuration of MBR systems, the market is segmented into submerged and side stream MBR. On the basis of geography, the market is segmented into North America, Asia Pacific, Europe, and Rest of the World (RoW). Of the two key application areas of MBR systems analyzed in the report, the segment of municipal wastewater treatment led the global market in 2012. Over the report’s forecast period as well, this market segment is expected to maintain its dominant position in the market and expand at a significant 21.70% CAGR.Of the key regions analyzed in the report, Asia Pacific is expected to be the region with the highest demand for MBR systems in the global market. In 2012, this region accounted for a 39% share in the global market. Europe accounted for a 19% share in the market in the same year. Some of the key companies in the global membrane bioreactor systems market are Asahi Kasei, Toray Industries, Inc., Mitsubishi Rayon Co. Ltd., Evoqua Water Technologies/Siemens water technologies, Kubota Membrane Europe Ltd., Tianjin MOTIMO Membrane Technology Ltd., United Envirotech Ltd., GLV Group (GLV Inc.)/ Ovivo Water, Koch Membrane Systems, Inc., Suzhou Litree UF Membrane Technology Co., Ltd, Beijing Origin water Technology Co., Ltd, and GE Water and Process Technologies.